Five days full of inspiration, great ideas, teamwork, and a lot of fun! That was Impact Week Kenya which took place from July 21 to 25 at the Africa Nazarene University (ANU) in Nairobi, Kenya. And the result: 17 amazing final pitches and great impactful projects! 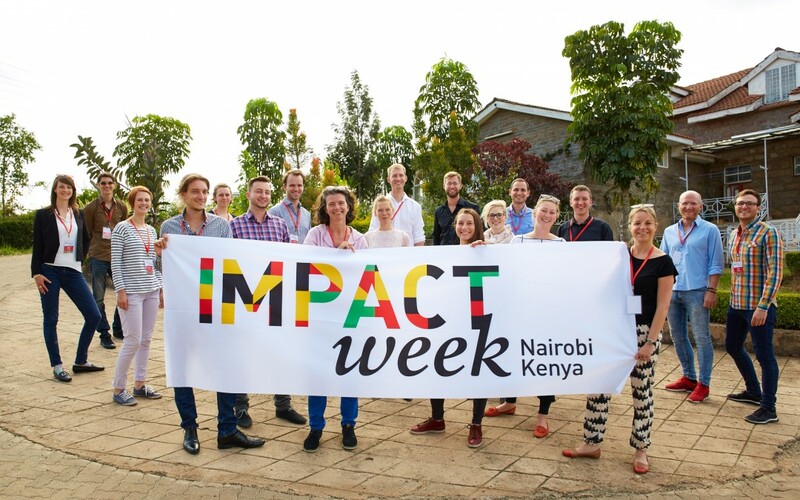 The core idea of Impact Week was to bring together experts from the field of entrepreneuship and Design Thinking with motivated students and faculty members of the ANU in order to design impactful ideas and sustainable business models. A total of 19 experts from Germany facilitated the workshops for 100 participants. Five different tracks framed the topics for Impact Week: education, health, finance, mobility and agriculture. The aim was to identify local problems and to create user-centered solutions and prototypes, followed by a business model that is built on the foundation of a mission and a vision with social impact – which also aims to generate a profit in order to be sustainable. Every day local experts attended the workshop to give inspirational talks. These special contributions were key to learning about the speakers’ experiences, reflecting on the challenges of the current project and gaining new ideas on how to take the next steps forward. Furthermore, one important aspect of Impact Week is that the work will continue, by building on the spirit and the outcomes of the workshop and by taking the ideas developed during those five days to the next level. Therefore, 8 out of the 17 teams will get the chance to be part of the new ANU accelerator that will help the teams to bring their ideas to reality. Additionally, Kenyan experts in social entrepreneurship will mentor the students in the upcoming month. An app, that helps people to find the best way to avoid traffic jam as good as possible. The whole expert team from Germany was amazed and impressed by the power, the motivation and the passion the participants put into the process. Apart from the outcomes, the learning process offers impact on an additional level. We will be curious about the next steps and are happy to take part as mentors at the Innovation Incubator of the Africa Nazarene University! It was a great experience for all of us and we hope that the seeds will now begin to grow.